Home / Bridesmaids Buzz / Introducing Jenny Packham Bridesmaids! The Dessy Group has teamed up with UK's successful ready-to-wear and bridal designer, Jenny Packham, to bring our bridesmaids her beautiful, romantic styles! Join in the ranks of Kate Winslet, Mandy Moore, and Adele who have graced the red carpet in Jenny Packham. 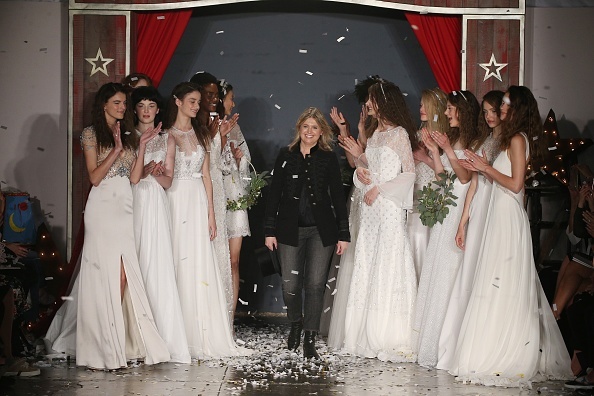 Designer Jenny Packham at Jenny Packham Spring/Summer 2018 Bridal Collection Fashion Show. Image Courtesy of Getty Images. We'll cheers our cup of tea to that! Keep scrolling for a peak of just some of the chic styles from the collaboration. Contact your local Bella about in-store promotions and discounts! Cheerio!